PCSO Finney talking to Year 6. 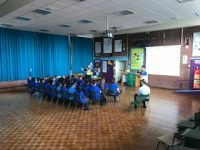 On Thursday 19th July PCSO Finney came into school to talk to the Year 6 children who will soon be leaving us. PCSO Finney wanted to talk to the children about how to stay safe on the streets and avoid being taken in by gangs. He also explained the dangers of crime and what the children can do to stay safe. It was a very informative session and the children found it very helpful! This entry was posted on Thursday, July 19th, 2018 at 10:28 am	and is filed under Keeping Safe. You can follow any responses to this entry through the RSS 2.0 feed. You can leave a response, or trackback from your own site.